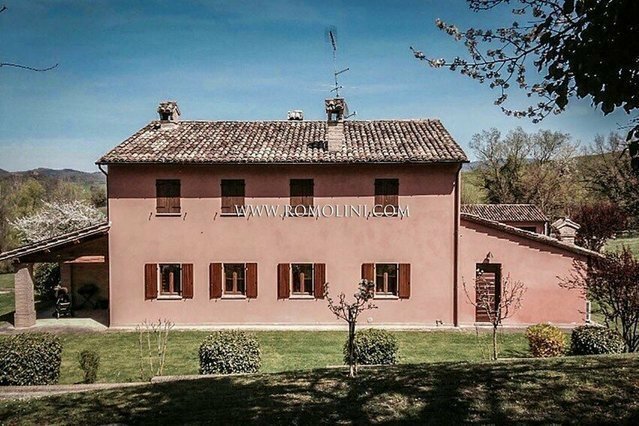 A short distance from Acqualagna, in Marche, this 275 sqm villa with dependance is perfect as a private residence not far from the city. The villa is surrounded by 7,830 sqm of garden where one could easily build a swimming pool. The location is also extremely comfortable to visit several of the most beautiful towns of central Italy, such as Urbino or the independent Republic of San Marino. GEOGRAPHIC POSITIONIn an open and sunny position in the municipality of Acqualagna, in the Marche, villa with dependance and fenced land for sale.The property is located a few kilometers from the Natural Reserve of Gola del Furlo, an ancient ravine carved out among the mountains by the erosive action of the Candigliano River.To allow the passage of people and vehicles, the Roman emperor Vespasian had a gallery opened in the narrowest point of the ravine and it was known at the time with the Latin term forulum (meaning lsquo;small holersquo;) which led to the current name Furlo. Nowadays the gallery is no longer visible since the river was dammed for safety reasons.The property is reached via a short private road.The nearest towns, Urbania and Acqualagna, are reached in no more than 10rsquo; by car. Urbino, beautiful Renaissance city part of the World Heritage List, is 20rsquo; away. The Adriatic Riviera with Fano, Senigallia and Cattolica is just an hour away, as well as the seaside locations of Riccione and Rimini.Through the A14 highway, one can easily reach Cesena (1h 30rsquo;), the Republic of San Marino (1h 20rsquo;) and Bologna (2h 10rsquo;) with its airport.The most useful airports are Ancona Falconara (93km; 1h 5rsquo;), Perugia Santrsquo;Egidio (93km; 1h 20rsquo;), Firenze Peretola (179km; 2h 35rsquo;), Bologna Marconi (215km; 2h 10rsquo;), Roma Ciampino (274km; 3h 15rsquo;) and Roma Fiumicino (291km; 3h 20rsquo;).DESCRIPTION OF THE BUILDINGSThe main villa (240 sqm ndash; 2,582 sqft) is laid out onto two floors and made up as follows:- Ground floor: entrance from the loggia, living room, ample living room with dining area, kitchen, bathroom, pantry, laundry, cellar and technical room. Both the living room and the dining room have direct access to the loggia equipped with a wood-burning oven and ideal for al fresco dining.- First floor: 4 ample bedrooms, 3 of which with en-suite bathroom and one with walk-in closet.The dependance (35 sqm ndash; 377 sqft) is currently used as a garage but could be easily converted into a habitable building.STATE AND FINISHESCompletely restored respecting the traditions of local buildings, the villa is fitted with cutting-edge systems and covered in prestigious materials.The under-the-floor heating/cooling system grants a minimal thermal dispersion and a constant temperature inside the building.EXTERNAL AREAThe villa is surrounded by approximately 8,000 sqm of land, fully fenced and capable of hosting a swimming pool (for which a project has been partially completed).